Every winter I suffer from Vitamin D deficiency, lack iron and I am always in need of vitamin B throughout the year. It’s so difficult to keep up as my body seems to change according the season and I have no idea when I should be taking my vitamins. Luckily, Hello Day, developed by doctors and pharmacists have a solution which will help you keep in tune with your body’s natural rhythms according the season. Designed specifically to help you prepare for and meet the challenges and changes that each season brings. So its a subscription box, just like the makeup ones you can get, but vitamins. Its so easy. Every season, they send you a box in the post (above) containing the supplements that you need to start getting your body ready for the months to come. For example, in Autumn, they will send you a selection of the best natural vitamins to boost your immune systems. There are of course, 4 seasons – Spring and Summer and Autumn and Winter which will help your body get ready for every new day and the days ahead. What’s great about vitamins is that they are mainly natural and plant extracts, with no chemicals or nasties, so they are good for you and no full of all the sugars and E numbers a lots of shop bought vitamins have. 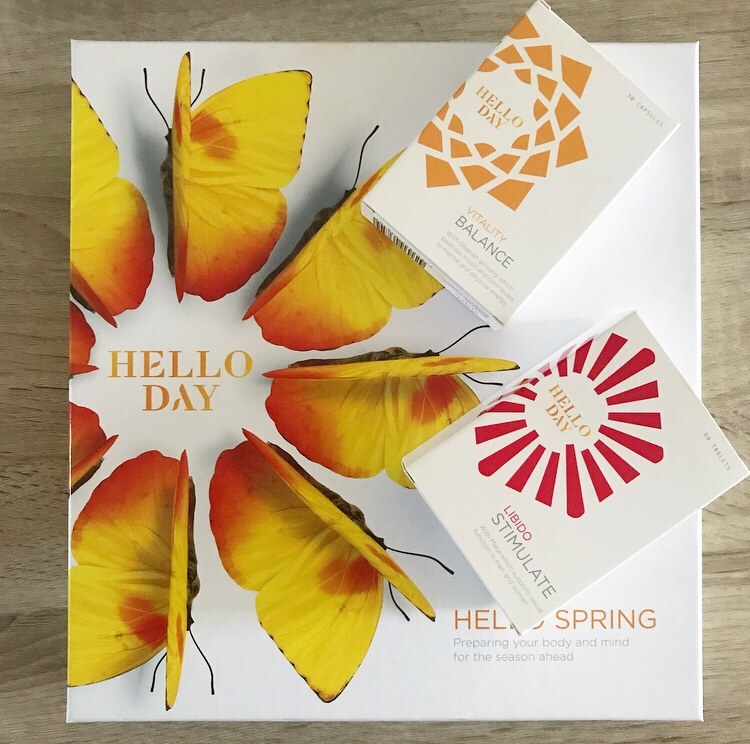 The Spring Box I tried out the Spring Box which has been designed to help you naturally balance energy and vitality levels, stimulate libido, boost drive, improve blood pressure and blood circulation and detoxify your body to improve digestion. Vitality Balance – to restore and maintain energy levels Ingredients combine Magnesium and Siberian Ginseng to help reduce tiredness and causes of fatigue while strengthening mental and physical energy. Digestion Detox – to flush out toxins and improve gut health Ingredients include Fennel Fruit Extract to support a healthy appetite and aid the digestive tract in a detox cleanse. Libido Stimulate – to boost physical drive naturally Ingredients combine Maca Root Extract and Magnesium to help reduce fatigue, address loss of libido and promote desire. Circulation Activate – to improve blood circulation and feel healthier Ingredients combine Red Vine Leaf Extract and Blackcurrant Berries Extract to help improve blood circulation and lower blood pressure naturally. I have been taking the supplements and vitamins for a couple of months now, mainly the Vitality Balance and Libido Stimulate in the mornings to give me energy each morning before a busy day. I have been taking them together in the mornings and I have felt a real difference to my health – I feel energised and less exhausted. The Digestion Detox and Circulation Activate are great for the evenings and at lunch time which help you digest your food better and feel less bloated. According to their website, the programme is for two months over 60 days where over month 1 you take supplements for 15 days and month 2 where you take libido and circulation activation for 60 days. I would however, take them according to how you feel as you know your body best.